Sweden's first satellite, Viking, was launched on 22 February 1986 as a piggyback payload on the Ariane-1 rocket that orbited the French remote sensing satellite SPOT 1. 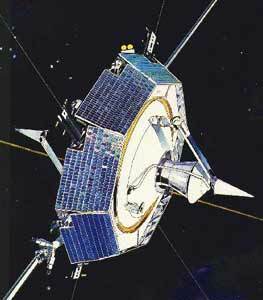 The satellite conducted a very successful magnetospheric research mission until 12 May 1987. The Viking project was managed by the Swedish Space Corporation (SSC) under contract from the Swedish Board for Space Activities, the government space agency. SSC is a government-owned organization responsible for the execution of Sweden´s space program. The satellite was developed by SAAB Space with Boeing Aerospace as a major subcontractor. Viking's perigee boost motor placed this relatively small satellite (286 kg) into a final 817 km - 13,530 km polar orbit, where it conducted scientific observations of complex plasma processes in the magnetosphere and ionosphere of the earth. The satellite carries experiments to measure electric fields, magnetic fields, charged particles, waves, and auroral images. These experiments were supplied by scientific teams from Sweden, Canada, Denmark, France, Norway, the United States, and the Federal Republic of Germany.